To begin this week’s edition, I want to say a BIG congratulations to West Frankfort Mayor Tom Jordan and to all the citizens of West Frankfort on receiving federal and state grant money to make improvements to the West Frankfort Mall. The city has been working hard to repurpose the mall to provide a facility that attracts new businesses and jobs to the region. The $2 million award from the Federal Economic Development Association will go to improve parking lots, install a new HVAC unit, ensure entryway safety and security, and build better roadways surrounding the mall. Click here and go read the whole press release! I want to thank each and every single one of you that has reached out to my office to express your concerns and opinions on the very important issues we are facing as a State. This was a particularly busy legislative week, with hundreds of bills making their way to the Floor for debate and passage or failure. This week is known at the Capitol as 3rd reading deadline week. That means that rank-and-file legislators had until close of business today to get their initiatives passed. Let’s take a look at some of the action. Representative Bailey passes bill to double fines on people who drive around school buses picking up children. State Rep. Darren Bailey passed a bill out of the House Thursday that would double the fines for people who drive around a stopped school bus that is picking up or dropping off school children. First offense fines will be increased from $150 to $300 and second offense fines will be increased from $500 to $1,000. House approves Rep. Terri Bryant’s Seizure Smart School Act. House Bill 1475 will create a healthy and fiscally responsible way for students, their families, and their schools to deal with the ongoing challenge of students with epilepsy. Under this Act, the families and their schools will collaborate to create a seizure action plan for a challenged student. As part of the plan, each student will work with a delegated care aide, a school employee or paraprofessional who has agreed to receive training in epilepsy and assist a student in implementing his or her seizure action plan. Training must be provided by a licensed health care provider with an expertise in epilepsy or an epilepsy educator who has successfully completed the relevant curricula offered by the Centers for Disease Control and Prevention (CDC). Epilepsy training programs, which are not designed for medical professionals and are accessible to people such as family members, can also be administered to persons who are seeking status as delegated care aides under this Act. HB 1475 passed the House unanimously on Wednesday, April 9, and was sent to the Senate for further consideration. Illinois becomes first state in Midwest to adopt ‘Tobacco 21.’ Illinois became the first state in the Midwest to raise the buying age of nicotine products to 21 after Gov. JB Pritzker signed landmark legislation on Sunday, April 7. ‘Tobacco 21’ will apply not only to traditional products such as cigarettes and loose tobacco, but also to nicotine delivery supplies, equipment, and devices such as Juul. Starting on July 1, 2019, customers will have to present age-21 identification to purchase these products in Illinois. An age-21 ordinance is already in effect in the city of Chicago, and House Bill 345 extends this ban to cover stores throughout Illinois. 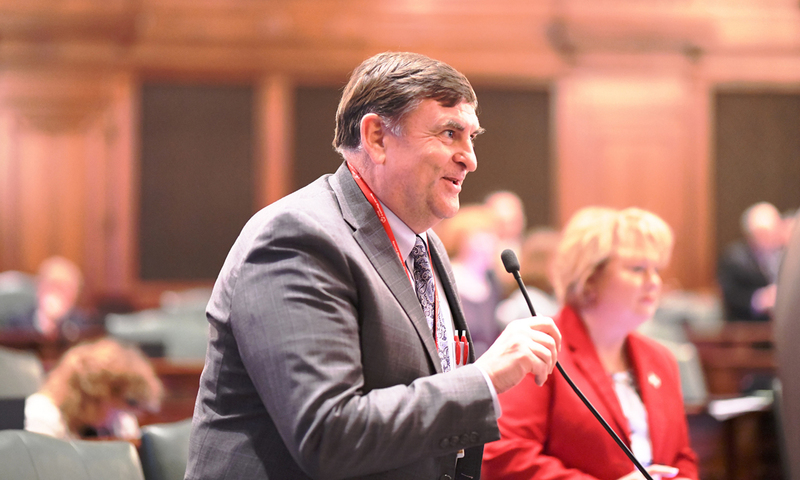 Passage of ‘Tobacco 21’ created extensive discussion in the Illinois House. Proponents pointed to sharply rising “vape” rates among Illinois young people, including young teenagers who may be getting access to nicotine from older friends. Raising the tobacco age to 21 will reunite the age-of-purchase law for tobacco, nicotine, and alcohol. Purchasers will have to show the same identification whenever they want to buy any of these products. 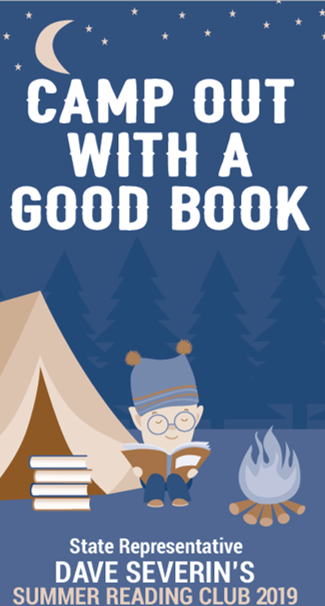 Announcing the Severin Summer Reading Program – Camp Out with a Good Book! Rep. Severin’s summer reading club challenges 1st through 5th graders to read 8 books during their summer break. Books for local library programs are also acceptable and books over 150 pages may count for 2 books. Click the photo to download a printable flyer. Once a student completes the book reading, please fill out the form and have a parent or guardian verify that the books were read. Completed forms should be sent to Rep. Severin at 600 Halfway Road, Suite 3, Marion IL 62922. Students reading at least 8 books will be awarded an official certificate from the Illinois House of Representatives recognizing their commitment to reading. Each will also receive a certificate from Culver’s for a free custard and will be invited to attend a Southern Illinois Miners baseball game with Representative Severin! The House headed home on Friday for a 2 week spring break. There are so many BIG items left on the agenda that you really should invest some time watching the action at www.ilga.gov and click on the audio /video link. 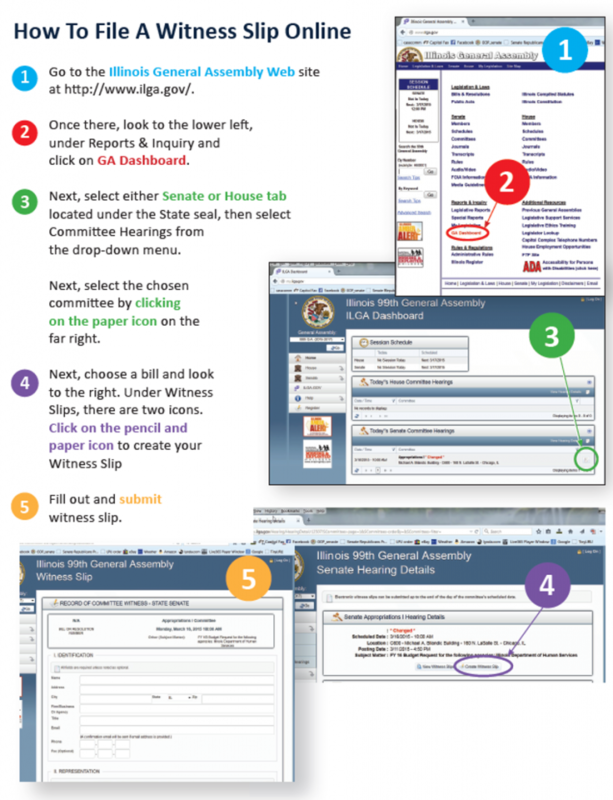 Don’t forget, as Senate bills start to move through the House, you can head to MY.ILGA.GOV to fill out a witness slip in support or opposition to any bill that receives a committee hearing. Here’s a refresher picture for those that might have missed last week’s edition. My office in Marion is open Monday through Friday from 8:30 a.m. to 4:30 p.m. and is located at 600 Halfway Road, Suite 103 in Marion. My office phone number is 618-440-5090.